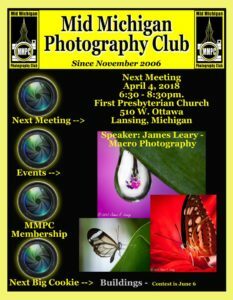 The April meeting of the Mid-Michigan Photography Club is scheduled for 6:30 p.m. on Wednesday, April 4, 2018 at the First Presbyterian Church, 510 W Ottawa St, Lansing, MI. This month we’ll have “James” Jim Leary doing a talk on macro photography. Jim’s background and expertise speaks for itself and it kind of runs in the family. So get ready to get up close and personal with your subject with tricks of the trade. Thanks to all who have contributed to the MMPC Photo Challenge. A reminder that the March theme is Looking Out. The April theme will be Reflections. A total of 46 photos were submitted by 24 MMPC members in February. A gallery of the February photos is on the web site at http://mmphotoclub.com/monthly-challenge/. The March photos will be added at the end of the month. If you do not use the Facebook group, send your entry by email to mmpclansing@gmail.com so that we can post it to the Facebook page. Discussion of the photos, beyond simply liking the picture, is encouraged. Members who post in all 12 months of 2018 will be entered for a gift card drawing at the end of the year. The June Big Cookie theme will be Buildings.